I love getting an early start on things, but flights at the crack of dawn can test a person's patience. Our plane left out of Detroit at 6:00 AM to wing us to Grand Junction, Colorado. From there we would drive down to Telluride to visit my brother and attend my niece's wedding. To get to our flight we had to get up at 3:30 AM. Ouch! All that was almost forgotten when we arrived at Grand Junction. There was a brilliant blue sky and a nice high desert wind. We picked up the rental car and headed to the scenic Colorado National Monument, which has a series of amazing overlooks into Monument and Ute canyons. 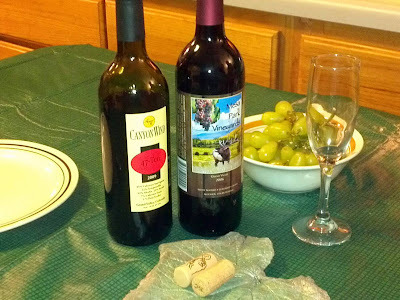 We were then able to visit four Colorado wineries: Mesa Park, White water Hill, Canyon Wind and Plum Creek. I'll detail those visits in coming posts. Two and a half hours later we were scouring the mountainside for Jay's house. All the efforts to coax our under powered rental car over the mountain passes finally paid of. We were able to uncork a nice 2009 47-10 blend from Canyon Blend. This is winemaker's blend of Cab Sauvignon, Tempranillo, Merlot, Syrah, Cab Franc and Petit Verdot. Did they leave any out? The wine was a great pairing with sandwiches and corn on the cob. The wine is fruit forward with a touch of sweetness. It's also a great value at only $13. I like Canyon Winds 47-10 Red as well! The Petit Verdot is yummy as well.